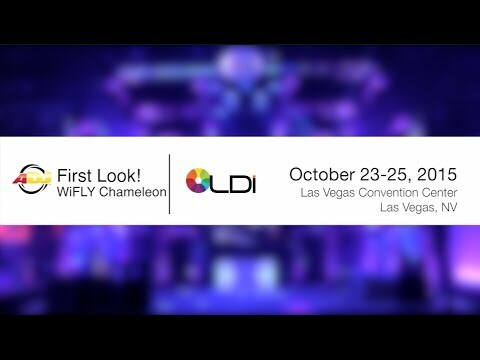 The ADJ WiFLY Chameleon is a unique uplighting fixture that creates three beams from one lens with offset colors for a one-of-a-kind effect. It also features a rechargeable lithium battery and ADJ's WiFLY EXR ""extended range"" wireless DMX. The ADJ WiFLY Chameleon creates 3 beams from one lens with offset colors for a one-of-a-kind effect. This unique wall washing fixture is powered by three 15W RGBA+UV (5-IN-1) LEDs, has a built-in rechargeable lithium battery, and includes ADJ’s WiFLY EXR “Extend Range” wireless DMX up to 2,500 feet. The lens is adjustable to create different effects on a wall. Plus there is a multi-angle kick stand on the bottom for further adjustments.